This guide will walk you through the process of migrating your VIP time and WSGold from your old account to your new account. Please follow the steps below in order to complete the migration. First you must be logged into the t4c.com account you wish to have the VIP and WSG transferred too. Please pay close attention to the next step: Select the Active Server that your account resided on previously. Once you've completed those steps, the remaining directives are relatively straight forward. Simply navigate to the Game Guide > System > VIP And WSG Migration. Hint: Be sure you're migrating the VIP time and WSGold to the correct account! 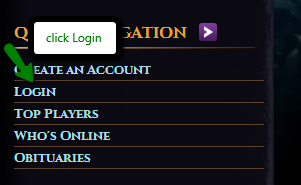 Provide your old account credentials, and hit go! 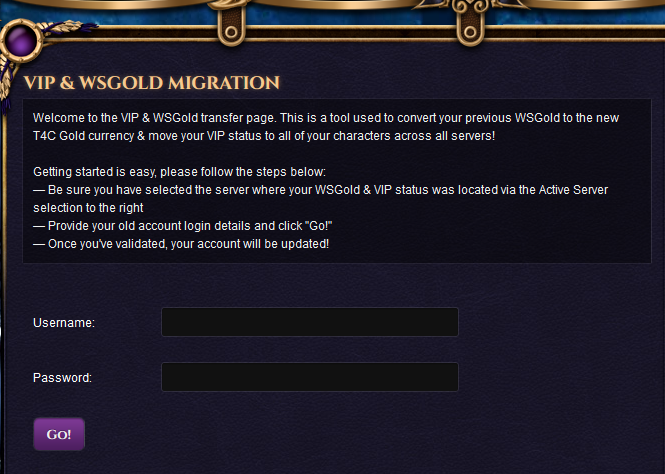 Once you've successfully authenticated, your VIP time and WSGold will be added to your account.